Chef Tiffany and her amazing team arrived on time, to our wedding reception and provided an amazing shrimp boil dinner! Everyone loved the food and are still talking about the bourdon bread dessert, delicious! Thank you Chef! Our food was the talk of the night!!! They were fantastic to work with! A must have for your event or wedding!! Our wedding guest kept going back for more!! Lesgo personal chef catered my wedding and did an amazing job! They were friendly, my family loved them. The food was displayed beautifuly and tasted as good as it looked. They went above and beyond my expectations and helped make my wedding day unforgettable! We chose the shrimp boil menu and it was wonderful! Food was fresh, colorful, delicious, and plentity to eat. Tiffani and Leslie took care of everything and it was worry free. Everyone who attended the rehersal dinner raved about the food and service. We recommend using LesGo Personal Chef!! I was looking for a caterer for my wedding and Lesgo Personal Chef was recommended to me by several people. I wanted to take to the time to reccomend them to someone looking for a caterer for any services because I was so pleased with the services that was provided. The food was excellent, just what I wanted,it exceeded my expectations. The decorations that Lesgo provided and time and care they put into my day was amazing!! Lesgo took the time to listen to my wants, my needs, my expectations, and my concerns, they helped make my day perfect. Thank you guys ats Lesgo Personal Chef you were, you guys are amazing!! I had 5 months to plan my wedding and I tried calling different resturants and catering companies in the area and no one would help me since it was last minute. I called Lesgo Personal Chef and they was great! They was able to fit my wedding into their schedule, the menu and the food was wonderful! They set up everything and serve my guest with a smile. 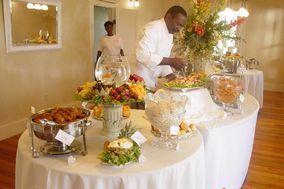 I have used Lesgo Catering for many occasions such as my wedding, reunions, etc. They are the ONLY catering business I will use for ALL of my events. They are professional, reliable, considerate, kind, honest, hardworking, etc...the list of qualifications is endless. The food prepared as well as the menu choices are savory. I have always been impressed by their professionalism and kindness! Amazing! The food was wonderful! The service beyond wonderful! And the price...so awesome! Seriously had a wonderful experience. Please use if in the fort walton beach area and want delicious food. Had alsorts of appitizers as our meal and they were delicious.